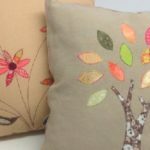 An applique cushion is an ideal upcycling project’s as you can use up pieces of old clothes. It’s also one way of using treasured family heirlooms. Artisan Stitch has won a certificate of excellence for best sewing classes in Edinburgh. Jen has over 40 years of sewing experience, more than 20 years of those in a training role. Invitation to a demonstration of traditional Icon painting. Using Egg Tempera technique. It will be a Russian Style that involves working with thin layers of paint. It is a very unique method of painting. Using light to build shapes instead of shadows. Starting from foundations that are almost darkest tones and then applying thin layers of light. Then the magic happens and an image emerges from the surface. 1. Brief explanation of the technique and meaning of Icons. 2. Preparation of egg yolk binding medium. 3. All the stages of painting. There will also be a chance to try some painting. Mix some pigments with egg medium.Have some fun. Great for those who would like to try it out.